National Geographic Channel and Nerd Nite are back in San Diego again for another free special edition of Nerd Nite. This Nite takes the audience on an intergalactic journey through Earth and to Mars to celebrate the second season of NatGeo's Mars and its upcoming new series, One Strange Rock. Mars vs. Earth - a classic battle! 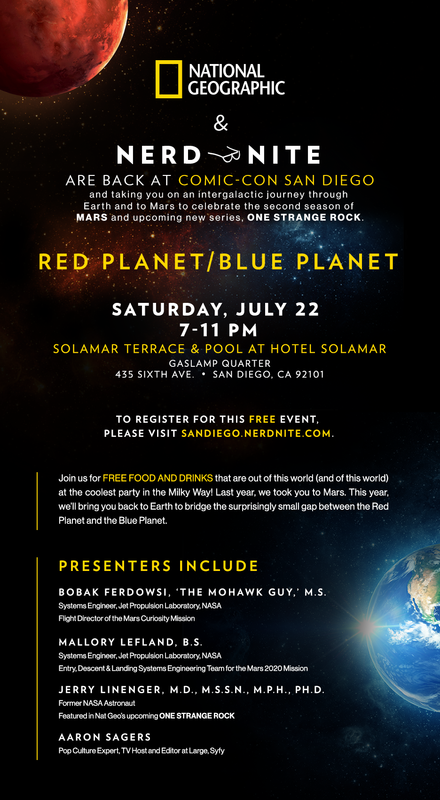 Find us on Saturday July 22, 2017 from 7-11pm at the rooftop terrace and pool at Hotel Solamar at 435 Sixth Avenue in the Gaslamp District. As always, the Nite will feature three funny-yet-smart presentations by JPL's Bobak Ferdowsi ('The Mohawk Guy') and Mallory Lefland, former NASA astronaut Jerry M. Linenger, and Aaron Sagers (Editor-at-Large of Blastr.com). And also as always, there will be FREE FOOD and DRINKS!